Pictured below is a new hen house lighting controller we recently made. This device is designed to controller artificial lighting in hen and other poultry housing to trick the birds into thinking it is summer even during the winter so that their egg yield is kept high throughout the year. It is based around our REUK Poultry Lighting System but with a few modifications. This particular version makes use of both a light detector and a programmable digital timer. The user sets the timer to turn ON before dawn and turn OFF after dusk. During the hours of darkness between the timer turning ON and dawn, and then between dusk and timer turning OFF, the artificial lights are turned on. 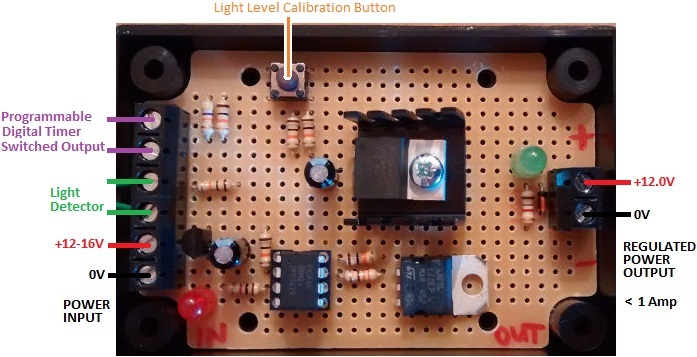 The output from this device passes through a low-drop 12V regulator to protect LED bulbs from excessive voltage. With the timer turned ON for 15 hours per day (e.g. from 4am to 7pm), the level of light in the hen house will be optimised for the birds’ laying; and the light detector prevents the artificial lighting being on when not necessary (due to ambient lighting) which reduces the cost and size of the solar panel and battery used to power the system. If you need any type of automatic poultry lighting or door opening controller, email neil@reuk.co.uk with details of your exact requirements.